Our family woke up to a screeching gas alert of a combination CO and explosive gas detector. Fortunately, there wasn’t an actual emergency -- it was a false alarm. After a few more false warnings over a period of many months, we grew suspicious. Searching the reviews of the model #KN-COEG-3 online, we learned that numerous consumers also received gas indications that they believe were faulty. Carbon monoxide is odorless, colorless, and tasteless. However, natural gas (methane) has a horrible smell due to an added odorant (ethanethiol, butanethiol, methanethiol/methyl mercaptan, or tetrahydrothiophene). So, if there was a methane gas leak in the house, we’d smell it. Our stove, furnace, and water heater are relatively new; and are regularly maintained. However, that is not a guarantee against a gas leak. Home detectors don’t last forever. They have a limited lifespan due to their sensors. 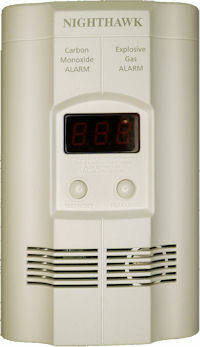 CO detector date of manufacture. It isn’t so much of an expiration date, but a recommendation based on an educated prediction that the materials in the sensor have degraded beyond reliability. Kiddie recommends replacement of this model of Nighthawk CO & gas detector after 7 years. Okay. I guess this unit has an actual expiration date. Apparently after seven years this device starts chirping every 30 seconds and stops detection. That’s a little harsh. I hope it doesn’t happen at 3 o'clock in the morning. At the time this article was written, the detector should have had a couple of years left in it. But, since I am no longer confident in it, I replaced it. Rather than tossing the Nighthawk into a landfill, I took the opportunity to open it up and learn how it works. There’s a screw hiding underneath the label. I guess the warranty is void at this point. Like most modern consumer products, these devices are not user serviceable and aren’t intended to be opened. 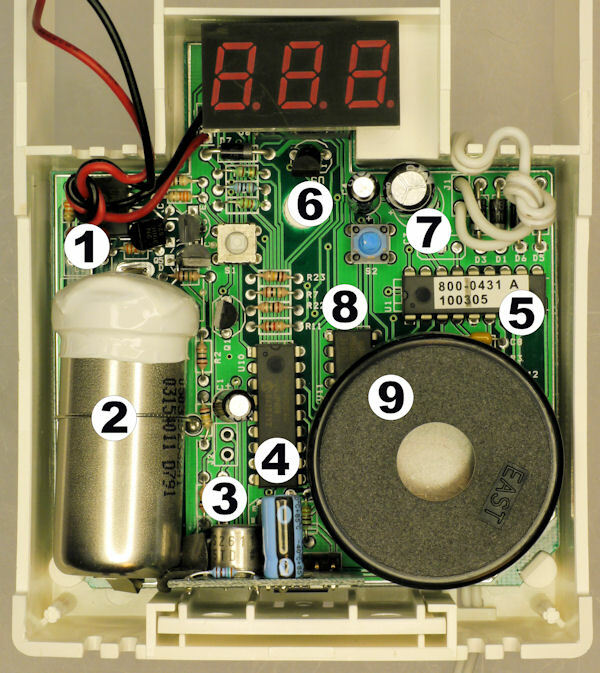 You shouldn’t open a life-saving device such as a detector, unless you aren’t going to use it again. It just isn’t worth the risk to yourself and your family’s safety if you mistakenly damage, disable, or reduce the sensitivity of the detector. In fact, I don’t recommend that you open electronic devices yourself. For example, TVs, power supplies, anything plugged in, or anything with high wattage capacitors can kill or seriously injure you. I am definitely surprised to see that the main board uses through-hole components. 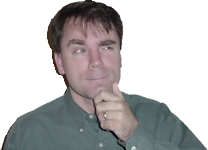 There is nothing wrong with that, but surface-mount parts are smaller and less expensive to mass assemble. Inside the Nighthawk carbon-monoxide and gas detector. Interface for reading the carbon-monoxide sensor using a Microchip MCP602 dual op-amp. 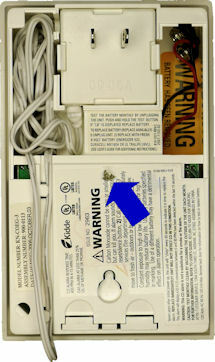 Carbon-monoxide sensor (proprietary part number). Likely electrochemical. It makes a sloshing sound when I shake it. May contain sulfuric acid or something equally hazardous -- so don’t puncture it. Gas detector on a small daughterboard. This is explained in more detail later on. Microchip PIC 16CR54C microcontroller for monitoring the CO sensor and driving the display. The particular chip is ROM-based, which is cheaper but not modifiable. Therefore, the program needed to be mature before mass production. Microchip PIC 16F628A microcontroller for monitoring the output of the gas daughterboard. This particular chip is Flash-based, which is more expensive but the program can be installed (and rewritten) at any point. The white sticker likely indicates the firmware version. 5 V power supply with a 200 mA Zetex ZSR 500 linear regulator and a 1N5817 Schottky diode for reversed-battery protection. 9 VAC input connected to a full-bridge rectifier consisting of four discrete 1N4001 diodes. R&E International RE46C101 piezoelectric horn driver and LED driver. This chip powers the sound. EFM-290ED high-output (90 dB minimum) piezo transducer sounder. This is what wakes you up at night. You can see that this commercial device is no different than any of the robot projects or other devices that you and I create. It has a 5 V power supply with diode protection. Also, it has an 8-bit microcontroller brain connected to a bunch of sensors. Let’s take a closer look at the daughterboard that contains the methane gas sensor.